The Bougainvillea House is a 'breath of fresh air' retreat from the exhilarating hustle/bustle of the French Quarter. This historic property is in the quiet, upscale residential heart of the French Quarter, short blocks away from Jackson Square, French Market, Royal and Bourbon Streets. There is a Choice of upstairs or downstairs townhomes. Each luxury suite is separate with it's own bedroom, full bath, kitchen and dining area and living room. Each one bedroom suite rents for $250 per day in offf season and $350 a day for special events. Some special events have a minimum stay of 4 or 5 days. Check-In is between 2 and 6 p.m. Check-Out is 11 a.m.
New Orleans highest ground, this property was never flooded in this pristine location. Owners live on the premises, close enough to answer any questions, to give you tips and directions to everything New Orleans, but separated enough to make you feel the accommodations are completely private and yours exclusively. The freshly renovated, gorgeous, lush foliage, with colorful plants and trees Courtyard is a restful and meditative spot for your escape from the non-stop excitement of French Quarter fun. There is even a separate private corner of the Courtyard with a wonderful patio, where you can completely unwind and sooth those overstimulated walking 'dog' feet of yours. Your choice of an upstairs or downstair private suite, includes granite countertops in kitchen and dining areas. Keurig complementary coffee brewers and LED BIG SCREEN SMART televisions in the living areas, boasting free unlimited Netflix movie entertainment, updated internet News Sites, Weather channels, and much more. Bedrooms also have LED televisions for in bed viewing.The end tables in each bedroom has an iPhone clock radio with lightning connector, and universal USB outlet in back for also charging your iPad or other smartphone device. You can stream your favorite Pandora or iTunes music. The snooze button on top controls the dimming of the time backlight, in case your sleep is distracted by a light in the room. There are desk areas in both suites, with a computer for checking your email or surfing the web for next day New Orleans activities, etc. Both upstairs and downstairs accommodations are fully and silently climate controlled for your personal comfort. You set the temperature you're happiest with. Luxury bed linens assure a wonderful night's sleep. The best restaurants in the world are right here in New Orleans. Stroll to the Mississippi River Walk along the top of the levee, the convention center, the casino, or take a paddlewheeler to the world-class zoo just up river. Hop on a historic streetcar and ride from the French Market to Canal Street, then to St. Charles along the gorgeous homes of the Garden District passing Audubon Park and Zoo, to Carrollton restaurants and shops along the River up town area. Visit nearby plantations or take a tour through the cypress swamps. Haunted tours include our famous, above-ground cemetery and other 'haunted' houses in the French Quarter. Antique shopping on Royal Street or the Magazine corridor offer the best buys in the world. Tile and granite private bathrooms with all linens, robe and hair dryer. Great place to stay in the French Quarter. This property has two rental units - we stayed in the upstairs Riverboat Suite. The downstairs unit had a king size bed and more modern bathroom, but the upstairs had more light, a very nice living room with an original brick wall and a balcony. So, even though the upstairs unit has a queen size bed, we preferred it in total although both are nice. This is a 200 year old building but all modern conveniences worked well - both heating and air conditioning functioned, the shower was great and the kitchen was nicely equipped. The owners live on site and are long term residents who know every inch of the French Quarter and the city. They are very friendly but respectful of your privacy and offered great advice on restaurants and destinations. The building has a secure street entrance and we walked the area for a week without any safety concerns. It's two blocks from Bourbon Street but on the quieter end of the Quarter and this particular street is quiet in general. Uber worked wonderfully when needed and all of our drivers were experienced but its easiest to navigate the Quarter on foot if your health permits. There are too many great restaurants to make specific recommendations here. However, I will mention that National World War II museum nearby is riveting. If you go there, book entry online in advance to get access to the movie that provides perspective on what you will see in the museum. It was a great vacation for us and staying in the French Quarter at this particular venue is highly recommended. Amazing Authentic Accomodations in the French Quarter! The location of this property could not be better! It is located on a residential street approximately two blocks from the quiet end of Bourbon Street. What makes the property location ideal is that you are halfway between Jackson Square and Frenchmen Street. You enter the property into a very large courtyard area. The rear of the courtyard has parking. The courtyard itself, is very private and beautifully landscaped with differ flora. It is quiet, shaded and relaxing. The units are HUGE especially when comparing to other FQ accomodations. There are two rental properties available -each has it's own character. Each unit is beautifully decorated, with antiques, and are very clean. We stayed in the upper unit -it had a very large bedroom, living room, kitchen and eating area -I would estimate that each unit around 900 square feet. There are two flat screen TVs, WIFI, and a laptop for guests use in each rental. We traveled with another couple who rented the lower unit. They loved the "authenticity" and character that was proudly on display by this property. It was an absolutely perfect set up -we could mingle together in the courtyard and then retire to our private lodging. I do not know enough words to describe hospitality, thoughtfulness and welcoming manner of the owners of this property! Upon arrival, Pat gave us a tour of the property She offered wonderful suggestions of where to go and what to do. Her husband Greg, born and raised in LA, shared wonderful stories and even offered to drive us (late at night) to Frenchmen Street. Upon arrival, each unit contained a bottle of wine, cheese and crackers, grapes and other "munchies." Although this property, in itself is amazing, the owners put it OVER THE TOP! We were even given parting gifts! WE LOVE THESE PEOPLE!!! I am sad that I missed the "midnight" tour but I will definitely be back for it! Pat and Greg were wonderful hosts. They have a wealth of knowledge of the area and very accommodating. Just wonderful people! The property was clean and very well updated. It was very secure yet easy to enter and leave at will and it was quiet unlike Bourbon St. It is only a 10 minute walk from Bourbon St and less than a five minute walk from the trolley car. It's quicker to walk though, the trolley system can be slow. Thanks Pat and Greg! Wonderful location in the heart of the French Quarter!!! My girlfriend and I were looking to take a quick weekend trip and this worked out perfectly. Pat met us at the front and showed us around and even offered to make us breakfast in the morning. We thought the location was perfect as Jackson square was minutes away, as were bourbon and royal streets. But being on the east side of them it also was a few minute walk to Frenchmen street, where there’s plenty of jazz and other music to enjoy...which we definitely did. I would definitely recommend staying here to anyone. Thanks Pat!!! We stayed during the first weekend of jazz fest. The room was comfortable, clean and decorated beautifully. Pat and Greg were perfect hosts. The patio was just outside our door and was great for relaxing. The location is great, quiet street , yet close to all the fun. Walking distance to Jackson square , French quarter and all the awesome restaurants. New Orleans is truly a treasure and this historic B and B is a great find! We had a wonderful 3 night stay. Greg and Pat could not have been more hospitable and helpful during our visit. The upper room is spacious, beautifully furnished with antiques, and yet contains all the modern conveniences one could want. It's well located and only a short walk to all French Quarter attractions, and yet secluded enough to provide a quite oasis from the crowds. We highly recommend this property! 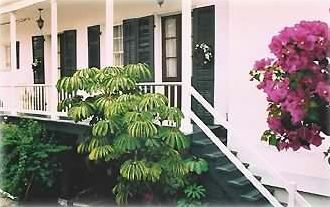 The Bougainvillea House is located in the residential section of the French Quarter on Gov. Nicholls between Burgundy and Dauphine Streets. $250 is the BASE RATE for EACH 1 BEDROOM, 1 bath, living room, dining room, kitchen, town home with all amenities, for two person occupancy only. Additional guests in the one bedroom suite will require an additional charge. This is best discussed with the owner before reserving the property to avoid complications upon arrival. No extra guests allowed without owner's permission. Special Event pricing is $350-$500 a night please check with owner. Special events have minimum number of nights required e.g. Mardi Gras is a 5 night minimum. We have an no refund policy.